June 7 marks the passing of Joseph von Fraunhofer. 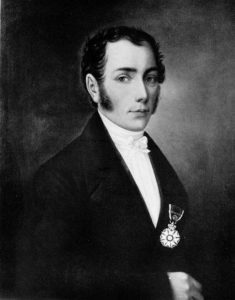 Fraunhofer was a German physicist who developed the first modern spectroscope. Previous spectroscopes used prisms to split light into its rainbow spectrum. Fraunhofer’s spectroscope combined a prism with a diffraction slit to expand the light further. He also added a small telescope to improve the accuracy of measurements. This device was used to examine the spectrum of sunlight and discovered thin dark lines. He noted and recorded the wavelength of over 570 of these dark lines. The largest and most distinctive lines were labelled with capital letters and weaker lines were tagged with lowercase letters. While Fraunhofer recorded so many of these lines, he never discovered what caused them. Forty five years later, Gustav Kirchhoff and Robert Bunsen would show these lines corresponded with absorption lines of elements. When a cold gas passes between the light source and the observer, some of the light is absorbed by the gas atoms and retransmitted at a lower frequency. The absorbed energy is essentially blocked and appears dark on the light source’s spectrum. These lines were named Fraunhofer lines in honor of the work done by Joseph von Fraunhofer.